We grow many popular varieties including Ginger Gold, Gala, Red Delicious, Golden Delicious, Jonagold, Jonathan, Rome, Stayman, Winesap, York, Granny Smith, Fuji and Pink Lady. Our apple harvest typically begins in late July and extends through mid-November. 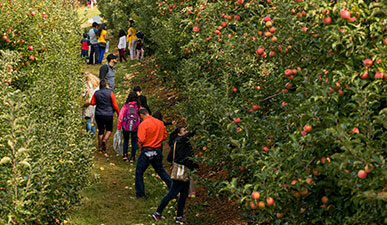 An average of 8-10 million bushels of apples are produced each year in Virginia. Virginia apples are destined for markets in 15 states and more than 20 countries. 75% of apples grown in Virginia are sold for processing and made into popular products such as applesauce, apple juice, apple butter, slices, and cider. Local apple varieties require 90 to 175 growing days from spring bloom to fall harvest. Depending on the type of rootstock, 100 to 500 apple trees are planted to the acre. Try selecting a different orchard or fruit type. 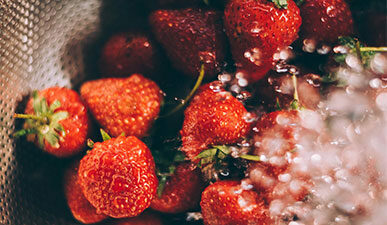 Explore a collection of resources on food safety handling and preservation practices put together by the Virginia Cooperative Extension. We’re glad you are visiting our Orchards! Here are some tips to help you make the most of your visit!